mmsonline.com DIGITAL EXTRAS MMS FEBRUARY 2018 14 mmsonline.com LONGFORM After Grinding, What's Left for Gear Hobbing, Shaping and Shaving? With so many advances being made in gear grinding technology, where does that leave processes such as hobbing, shaping and shaving? Schafer Gear Works explains its machining methodology. 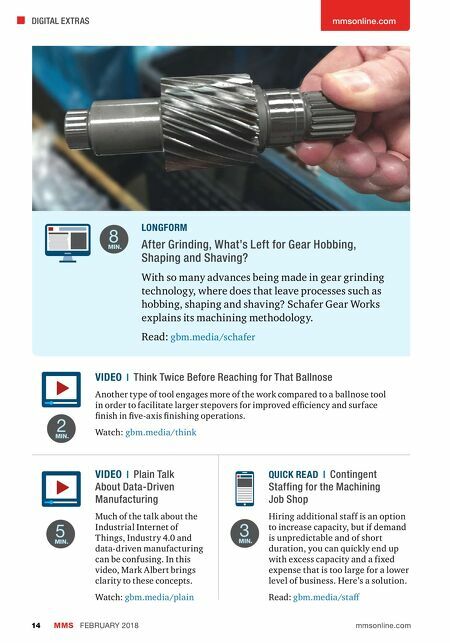 Read: gbm.media/schafer QUICK READ | Contingent Staffing for the Machining Job Shop Hiring additional staff is an option to increase capacity, but if demand is unpredictable and of short duration, you can quickly end up with excess capacity and a fixed expense that is too large for a lower level of business. Here's a solution. Read: gbm.media/staff VIDEO | Plain Talk About Data-Driven Manufacturing Much of the talk about the Industrial Internet of Things, Industry 4.0 and data-driven manufacturing can be confusing. In this video, Mark Albert brings clarity to these concepts. 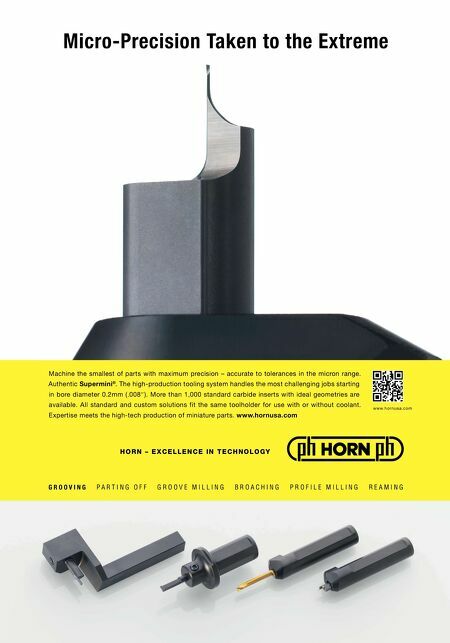 Watch: gbm.media/plain VIDEO | Think Twice Before Reaching for That Ballnose Another type of tool engages more of the work compared to a ballnose tool in order to facilitate larger stepovers for improved efficiency and surface finish in five-axis finishing operations. Watch: gbm.media/think 2 MIN. 5 MIN. 8 MIN. 3 MIN.